Ukulele Lessons Pensacola - Ukulele Lessons - Call Now (850) 453-9966! 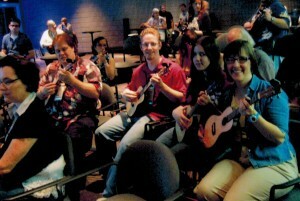 Ukulele Lessons with us are FUN, + VERSITILE, and focus on proper technique for a quality sound! Our Ukulele lessons are comprehensive for everyone, utilizing Songs of Different Styles and focusing on Types of Ukuleles, Tuning, Reading, Melody Playing Chords, Strumming Techniques, Scales, Tremelo Music Notation, Tab, and Ukulele History. We supply all the knowledge, patients, fun and skills you need to have a great experience. Ukulele lessons don’t have to be frustrating or difficult, but it does take practice. In fact, if you follow our lessons, at a much faster rate than if you tried to go it alone. If you are seeking beginner ukulele instruction, lessons for kids, or simply learning to play the ukulele for your own enjoyment, we will show you how to succeed while making your lessons easy and fun. In Pensacola, FL, we are your Family of Music Teachers – Join Us! We sell New Ukuleles for under $50!